Here are 4 reasons why you should pay them a visit soon. Twisted X Brewing’s specialty is Tex-Mex beer, the craft version of Mexican beers most people are familiar with. Think Dos Equis or Victoria, but with better flavor and brewed locally with quality ingredients. Most of their brews are lagers, which are time intensive and generally difficult to do well. My rule of thumb is to measure the quality of the brewery by the quality of their lagers (if they brew lagers, of course). Twisted X Brewing’s Tex-Mex Lager definitely measures up. It’s crisp, clean and easy to drink with a restrained bitterness and nice aroma. Perfect for camping and scorching summers. A Tex-Mex beer also uses ingredients common in Mexican cooking, like jalapeños or mole. 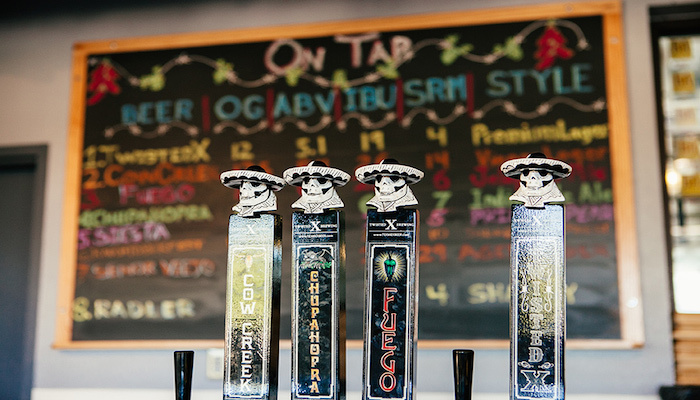 Take their beer Fuego, for instance, which is a pilsner brewed with jalapeños. As strange as that may sound to some, it works well. The jalapeños lend a gentle sweet and spicy flavor to the beer, making for unique and tasty beer to drink year round. Add Calypso to your summer beer list, too. It’s a pale ale with a bitterness that isn’t overpowering. The hops lend a really nice aroma and it would pair well with patio sitting, grilling and swimming. For the hop heads out there, the Chupahopra and Tribute Double IPA are solid bets. Your best option is to go to the brewery and ask one of their friendly bartenders for personalized recommendations. 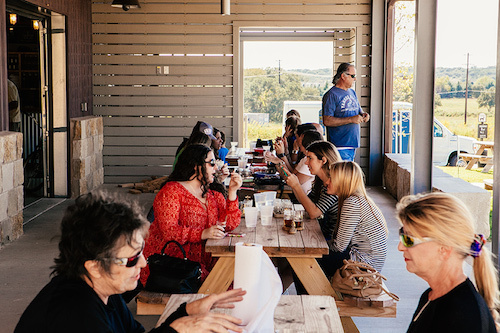 Located near the heart of Dripping Springs, Twisted X Brewing’s tasting room is housed inside a barn-like structure where you can find a good deal of seating and tasty beers. During my cold and rainy Saturday afternoon visit, the place was buzzing with families, groups of friends, bachelorette parties and basketball on surrounding TVs. From the tasting room, you can join a tour of the production facilities where all the beer is made, or simply take a seat in their attached overflow space. When the weather is nice, just outside the tasting room is outdoor space for kids and adults alike to enjoy. 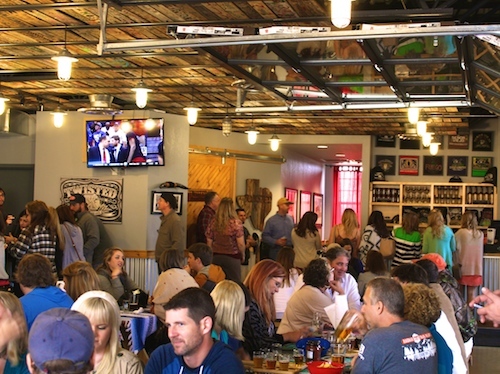 Overall, Twisted X’s tasting room is a choice setting for a weekend afternoon. 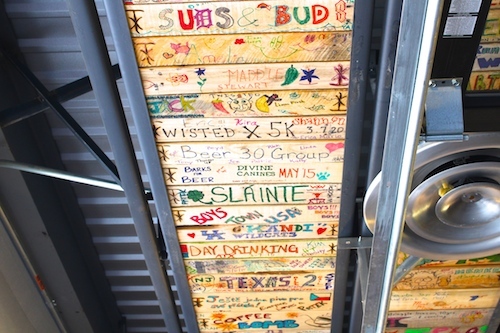 The tasting room ceiling of Twisted X is adorned with wooden planks decorated by visitors who stop by. It’s a cool way for the brewery to engage with customers and a way for visitors to leave their mark. It’s also something kids can get into. The planks are re-used pallets from their brewing operations and you can request one from the merchandise counter as well as a couple of markers. “The decorated planks fit with the personality of our company. We want to provide people with a relaxed and fun environment,” says Geoff Schalchlin, Tasting Room Manager. Most breweries are open only on the weekend or a handful of times during the week. Twisted X Brewing is open 7 days a week from midday until 6 or 8 at night. That means you don’t have to wait until the weekend to grab some of their special brews. You won’t find beers like their Tequila Barrel-aged Señor Viejo or Sour Blonde Ale at your local bar, so trying one on-site is a must. If you’re heading out for a Hill Country getaway, live or work near Dripping Springs or are just curious what a jalapeño beer tastes like, there’s a good chance Twisted X’s tasting room will be open for you when you pass by. 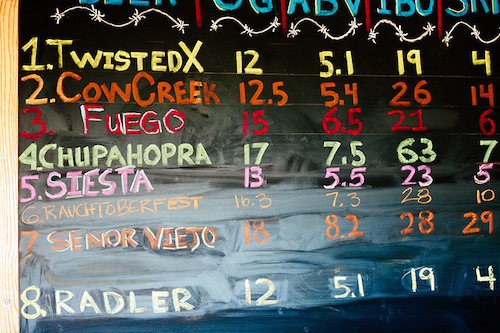 The Austin area is home to some really great breweries and Twisted X is definitely one of them. You’ll be hard pressed to find a brewery that can match what they’re doing. Their staff is incredibly friendly and very knowledgeable about the beer. Their space is comfortable, inviting and engaging. They’re open 7 days a week. But most importantly, they make great beer that is unique and tasty. They don’t sacrifice flavor or quality for gimmicks. 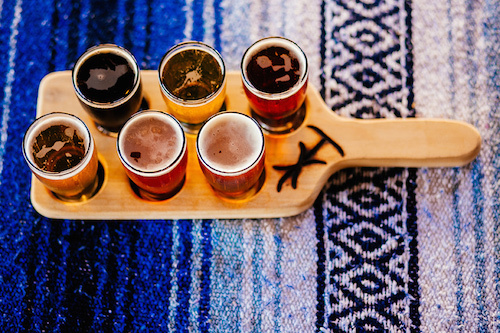 So if you’re looking for a place to hang out this weekend during a day out in the Hill Country, you should definitely pay Twisted X Brewing a visit. 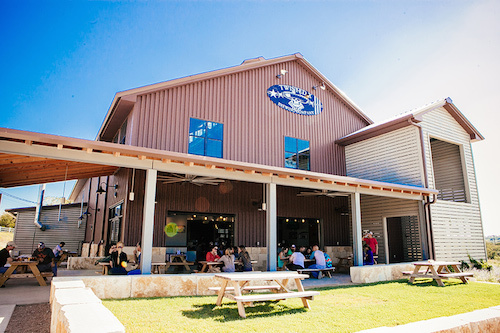 Twisted X Brewing Co. is located at 23455 W RR 150, Dripping Springs. Hours are M-TH: 1-8 PM, F-Sat: 11 AM-8PM, Sun: 12-6 PM. You can also find their beer in bottles and cans at most Whole Foods and HEBs. Have you tried any Twisted X beers?